Mon-Fri 8:00 AM- 5:00 PM. What Does Landscaping Cost in Calgary? Wireless sprinkler controllers are becoming very popular with our Calgary landscaping clients. They are a very handy because they allow you to activate or adjust your sprinklers from anywhere at anytime. You can do this using your iphone, desktop or tablet. Turn on different zones, adjust the time, dates to water, etc. All from your device or desktop. If you are going to purchase a wifi wireless sprinkler controller make sure you get one that syncs with the local weather network. This means your controller will automatically adjust the watering schedules and times based on what the weather forecast is. For example if heavy rain is forecast then the controller with turn the system off and wait to activate it again. This feature will definitely reduce the water consumption for your lawn and garden and in the long run it will save you money. Wireless sprinkler controllers do not cost much more than normal controllers so we highly recommend choosing this option if you have or plan to install a sprinkler system. 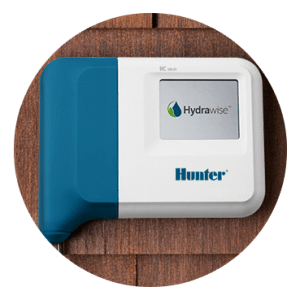 We recommend the Hydrawise sprinkler controller Ask us about installing a wireless sprinkler controller for your sprinkler system. Copyright 2018 Chinook Landscaping and Design Inc.